Established in 1909, Loudoun Gowf Club came into being following the demise of Galston Golf Club, which had only been in operation for a few years before it folded around the turn of the century. A deal was agreed with Lord Loudon to lease part of his estate for a new golf course and before long, a Mr Hydes had set out a full 18-hole course for the members, with a Mr Robertson from Troon engaged to look after the maintenance of the new holes. Various changes have been made to the course since then but it remains a modest layout, extending to just over 6,000 yards, with only one par five at the 512-yard 5th, “Castle”. A burn crosses the fairway as it veers left and rises towards the green so beware a rather benign stroke index of 9 for this hole. “Big Wood,” the 163-yard 4th is one of the newer holes on the course, added in the mid-1990s, with trees to the left of the green and a couple of bunkers to the right. The remaining four short holes at Loudoun are all located on the back nine and, rather unusually, they’re played back-to-back at the 10th and 11th then at the 16th and 17th. The signature hole at Loudon is regarded as “Marsh,” the short par four 12th, where the fairway is split by a burn that then runs round the right side of the green. This burn is the same one that hampers golfers on the 3rd hole, as it carries along the right side of the hole before slashing across the front of the green so first time visitors beware! If I could write a tagline for Loudoun Gowf it could be The Good, The Similar and the Just Plain Crazy. The good being some good quality golf holes namely, the opening five, along with holes 11,12 ,17 and 18. The similar being holes 6-9 inclusive,13 and 14, all of which are similar in nature and length and design. And saving the best till last, the just plain crazy, which is the position of the 15th tee, so close to the entrance/exit road that I don’t know why the Health and Safety Executive hasn’t been involved? To expand on the good holes, I would single out the 3rd Elbow, which utilizes the serpentine ditch to such an extent that you question your risk and reward or lay up options. The 4th which is a picture perfect par 3 over a hidden burn and the 12th, perhaps the best hole of the 18, a short par 4 which from the tee provides you with a split fairway but the second shot is a testing affair to a tough green which can be difficult to hit and hold. If I could give the people of Loudoun a bit of advice it would be to look at their policy at 17 and 18 which means a lot of hanging about. In short, a group will play the par 3 17th and then clear the 18th tee before the next group can go, a bit daft and over protective in my view. Loudoun is undoubtedly a nice course but I found too many holes to be up and down in nature, with some dog-legs thrown in to provide a bit of variety however, I can’t fault the conditioning and the value for money the Loudoun provides and it is a course, in my view, which is a perfect choice for any society day out. I was a little surprised to see Loudoun Gowf making an appearance in the latest Ayrshire & Arran regional listings on this website so I thought it was time to have a look at the course yesterday. There was a promising start to the round, with the semi blind 1st, the lovely par three 4th and left doglegged 5th noted as particularly decent holes. Unfortunately, the next four holes are all solid par fours with a similar yardage and they run parallel to each other so, as my playing partner commented, it feels like you’re playing the same hole four times over, back to back. The inward half starts in fine fashion with a couple of totally different par threes, one long and one short, before the terrific short par four 12th plays from an elevated tee to a raised green, via a fairway which is bisected by a drainage ditch – it’s certainly an unconventional design, but it works very well. The 15th (“Road”) plays immediately beside the busy A71 and I cannot for the life of me understand why the club has not been forced to erect some sort of fence or netting along the tee box area to prevent sliced drives heading towards the traffic. There’s also a real danger to cars entering or leaving the course at this point so how the club can seemingly overlook such a serious Health & Safety issue is a mystery to me – then again, perhaps that’s probably why you’re issued with an insurance ticket along with a bag tag when you sign in! Overall though, Loudoun’s a good track with lush, tree-lined fairways leading to well-proportioned, though relatively flat greens (two-tiered putting surface at the long par three 15th excepted). And despite having ditches crossing fairways to take water away, several soggy patches around the course indicate that drainage remains an issue. 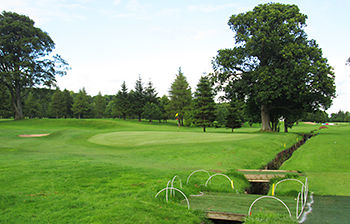 You’ll find pleasant parkland golf here in a manicured setting and even though it never really gets the pulse racing it’s one that ticks many of the “good golf experience” boxes.